Oscar Wilde once said 'Education is an admirable thing but it is well to remember from time to time that nothing that is worth knowing can be taught'. At Manthan, we intend to make children innovate designs which stimulate minds, motivate to explore, discover, make new connections to be able to meet the challenges of a dynamic, globalized and multi-cultural world. 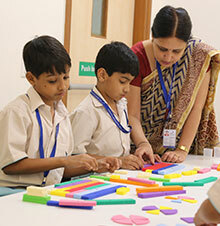 The Manthan follows the child centric integrated learning programme that promises measurable improvement in the cognitive skills of the learner. It actively engages students in the learning process, helping them to develop critical thinking skills, stronger understanding of concepts and meaningful learning experiences. The curriculum helps students integrate their learning across subjects, allowing them to learn in a comprehensive manner, reason abstractly and quantitatively. Its unique features help students understand different learning layers, where each layer comprises the skills and concepts that a student needs to learn in a particular grade. The assessment architecture of the curriculum goes deep to cull out learning gaps, even at a sub-topic level. Students benefit by connecting new learning experiences to their existing body of knowledge, assumptions and understandings and acquire skills needed in an ever-evolving information and digital age.